A few weeks ago I was driving home from a day out at the beach when I was hit by a car (by a driving instructor, of all people! Oh the irony!). Luckily it was a relatively low-speed collision – the guy rammed into me at a round-about – but it still left me a little shaken. I’m a fairly confident driver I would say, but when it’s not just about you but also your kids, things like that can give you a real fright and put the fragility of life and how quickly things can change into perspective. 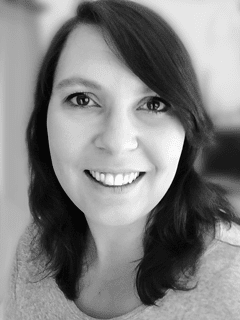 I had been in the process of upgrading my kids’ car seats at the time, as they are both outgrowing their respective ones, and initially I was just going to buy a relatively inexpensive booster seat or booster cushion for Becky, as she seemed the right age and weight. However, the accident made me re-evaluate all the safety measures in the car, and I decided to invest in a proper booster seat with back and side protection. 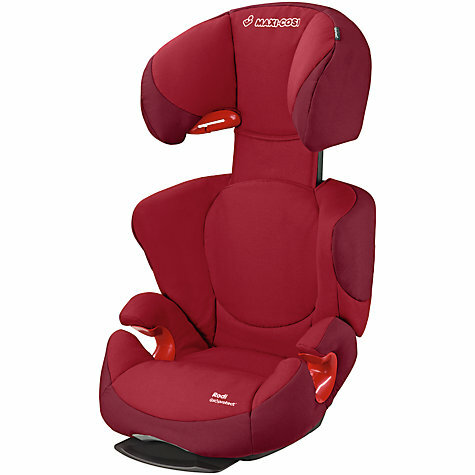 After lots of research, I decided to buy the Maxi Cosi Rodi Air Protect Group 2/3 high back booster seat. At £125 it’s not cheap, but I was persuaded by the good reviews and safety certificates of this award winning seat. And now that we have used it for a good few weeks and Becky loves it, I thought I would write a little review in case anyone else is looking for a booster seat from the ages of 4+. Before I even looked at any other brands, I checked out Maxi Cosi first, as I’m a big fan of their seats and have used the Cabriofix and the FamilyFix Base with both Becky and Alex, and Becky has been in the Maxi Cosi Axiss with its rotating base for easy access (another superb cat sear I can only recommend) for the best part of the last four years - which Alex is now going to be upgraded to. As I said before, the safety features were the most important factor for me in my decision to buy the Rodi Air Protect. 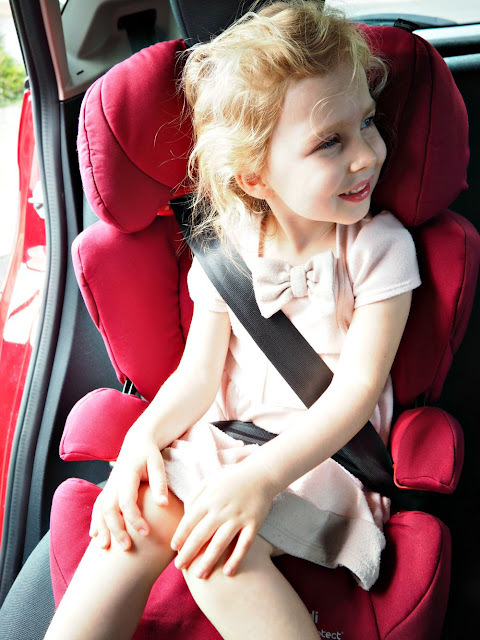 According to Maxi Cosi, 25 per cent of all car accidents involving children are side impact collisions, which means that the head of the child is extremely vulnerable. The seats’ patented Air Protect technology aims to alleviate this and provides extra support for the head, releasing air at the precise moment of impact and therefore protecting the child’s head and body, in essence acting like an air-bag. The headrest anchor gives added stability, so you can be sure that in case of an accident, it won’t move forward and is kept in position. Although at only 4.7kg the seat is remarkably light-weight and not bulky at all, it’s noticeably sturdy. It’s padded throughout so Becky is comfortable and cosy in it. The installation is extremely simple, using just the car’s 3-point seat belt, which means it’s easily transferable between cars, which is another bonus, as we are often swapping it between mine and John’s car. Becky loves it. Even though she liked being in the Axiss, she had been outgrowing it slowly but surely, and had found the harness in particular a nuisance of late, always complaining that it’s too tight (even though it wasn’t), and restrictive, whereas with this one, the car seat gives her a lot more flexibility to adjust to her comfort levels while still being safe. In fact, she loves climbing into the seat and fixing the car seat herself (I always check it’s done correctly, of course), and she feels like a big girl being able to do it on her own. The Rodi Air Protect offers a slightly higher seating position than many other models in this category, which means Becky is sitting a little bit more elevated and can enjoy the view out of the window. 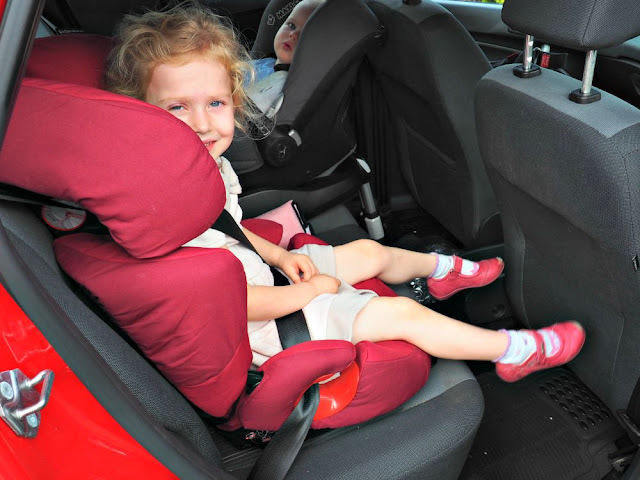 The Maxi Cosi also reclines, which is rare for a Group 2/3 booster, so it’s another big advantage for longer journeys and when she inevitably falls asleep in the car. The backrest and shoulder supports are adjustable, allowing the seat to grow with your child and ensuring that he / she will be comfortable at every stage. It also has removable covers, so it’s easy to pop them in the wash as and when necessary, and having washed the covers of my previous Maxi Cosi seats many a time, I can attest that they have a very good lifespan, too. Just to be on the safe side *excuse the pun*, I did compare the Maxi Cosi Rodi Air Protect to other brands and high back booster seats in the group before I purchased it, but none of them ticked all my boxes like this one. I can honestly say that in terms of safety features and overall performance, I am confident that I have made the right choice and that Becky will be as protected in the car as possible. Maxi Cosi tend to test their seats in excess of legal requirements, which I’m really impressed with. The price tag might be high, but if you consider that you will get years out of this seat, it’s a worthy investment - and you can’t put a price on safety, can you? So from both Becky and I, the car seat gets a big thumbs up and we can thoroughly recommend it.